You'll be £12.00 closer to your next £10.00 credit when you purchase Sherman Tanks of the British Army and Royal Marines. What's this? With production in excess of 55,000 the Sherman tank was eventually in service with most Allied armies of the Second World War and by the time of the Normandy landings was the mainstay of Britain\'s armoured battalions. 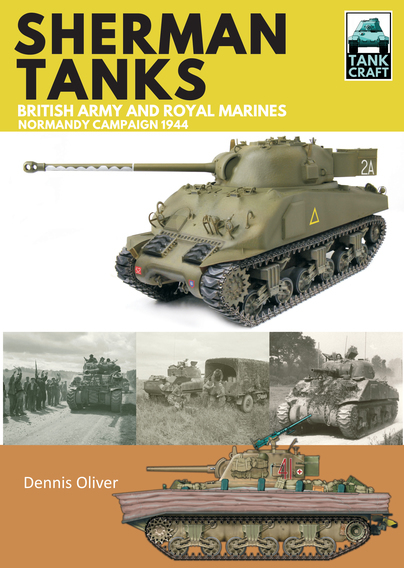 In his second book in the TankCraft series, Dennis Oliver uses wartime photos and extensively researched, exquisitely presented colour illustrations to cover the Sherman tanks used by the units of the Royal Armoured Corps and the Royal Marines during the fighting in northern France. As with all the books in the TankCraft series, a large part of this work showcases available model kits and aftermarket products, complemented by a gallery of beautifully constructed and painted models in various scales. Technical details as well as modifications introduced during production and in the field are also explained as is the complex system of markings employed by British armoured regiments. This book will give the modeller all the information and knowledge required to recreate an authentic miniature representation of the tanks that fought from the beaches of Normandy, through the battles for Caen and on to killing fields of Falaise. Quality Documentation that will delight car modellers, historians and military investigators. Having read a number of this author's book in the past you can count on this book to be well researched and quite thoroughly informative. Highly Recommended - Read the review online here. More history and period imagery closes a useful publication that's a good-value reference for any Sherman fan, but particularly those new to the subject and who favour 'Blighty's' armour. If you’re like me and you like books, tanks and models, these volumes will be informative right now, and I expect they will remain enjoyable to look at for a long time to come. This is a one-stop reference if you plan to build a British Sherman in Normandy after D-day. an interest in armoured warfare and the period covered. Highly recommend to model makers and historians interested in the Allied AFVS in Normandy. To think of tackling the Sherman as a whole in a book of this size would not be practical, so looking at a particular group of tanks and in a particular time and place makes it much more manageable. I am sure that British Armour fans will welcome this one. Dennis Oliver is the author of over twenty books on Second World War armoured vehicles including Codename Swallow: British Sherman Tanks at Alamein, To The Last Bullet: Germany's War on 3 Fronts, Westwall: German Armour in the West 1945, Viking Summer and A Sound Like Thunder.